Because of the bastardisation of mythology into history over the past 1500 years or so, any research on the internet about the origins of the story of the Garden of Eden quickly disintegrates into a wild goose chase for its original location, with any number of possible Mesopotamian locations being offered up. And so via that cyber rabbit hole of infinite length and diversity of possibilities, we are quickly shepherded away from searching for the real meaning of the story of The Garden of Eden, or at least one that makes sense to mystics and mythologists. This enchanted Land of Paradise Lost has been presented to us in so many myths, stories, plays and artwork over the millennia, not least of which as a wonderful triptych painting, The Garden of Earthly Delights, by Hieronymus Bosch. 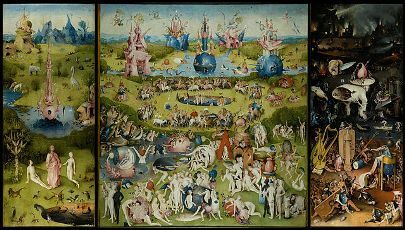 But Bosch was not the first enlightened artist to use the metaphor of the pleasure garden or the fairground to encapsulate the problem of the human condition. This enchanted meme that haunts our dreams and daydreams, of an ideal life in a ever-abundantly fruitful garden, was also expressed in Joni Mitchell’s Woodstock. However, while “we’ve got to get ourselves back to the Garden” might have been a great rallying call for the Green movement, it occurs to me, more and more, that the “way home” for human beings, to connect back to Source, is for us to actually leave the Garden. The Garden of Earthly Delights, the pleasure garden or the fairground is often used as a metaphor by our spirits to denote a particular idea… and this has come down to us in the ancient myths and sacred literature which was largely composed, originally, by our enlightened early ancestors. The Garden of Eden story in Genesis is actually based on a much older Babylonian story, and it was one which was composed before the serpent was demonised by various solar priesthoods. At the time, the serpent represented wisdom, and so to take the advice of the serpent to eat the “apple” (actually it was a pomegranate, with its seeds of wisdom) from The Tree of Knowledge of Good and Evil (the World Tree) would be a very good idea if we’re to lose our naivety and ‘ignorance is bliss’-type of naked innocence to who we really are. This interpretation of the Garden of Eden story turns the one in Genesis on its head, and the same metaphor has also been used in many different forms of media….. I’m sure others will be able to help me out here with examples. But for instance, there is the fairground of Disney’s Pinocchio, and also the pleasure garden in Studio Gibhli’s Spirited Away. In both cases, the people there are trapped by their own greed and lust – their desires to experience the pleasures of the five senses of the flesh. 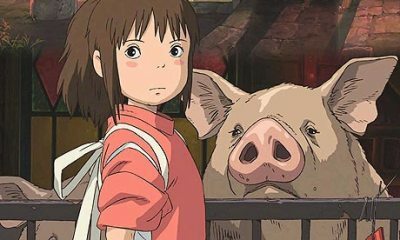 In Pinocchio, the upshot is that they are turned into donkeys; in Spirited Away, they become pigs – as if to illustrate that they are now trapped in their animal nature and cannot realise their Divinity. So surely then, this is not a Garden that we want to get back to… but a Garden that we need to swiftly leave, by walking between the two angels, with their flaming swords that form the twin pillars which always frame the liminal gateways between worlds, or dimensions. In other words, we begin our journey of self realisation by learning how to journey into these other worlds and by getting guidance from the entities or spiritual teachers that we meet there. But it takes courage – because we could also compare this state of being to the one Neo finds himself in, in The Matrix, where he has to decide which colour pill to take. He was given the stark choice. “Do you want to stay in a state of comfortable ignorance, or do you really want to know the Truth?” If the latter, he had to leave the world which blinds us via the seeking of pleasure through our five outer senses, and enter one where he quickly develops a new way of seeing …. and the food is awful! We also have to leave behind all our old ideas and open our mind to a new way of seeing. This can be painful at first… and it does require something of a journey and, like the Fool of the Tarot, who sets out on his journey by stepping off a cliff, we need to have faith that the ground will rise up to meet us in the form of the teachings from many guides and tutors that we encounter along the Way. Some of those teachers are ‘good’, and some are ‘bad’ – but they are all teachers and we learn something from each of them, even the worse – if we can open our minds. But first of all, we have to dismount from the enchanted merry-go-round, put down the sugary sweet candyfloss, leave the delusions of the Hall of Mirrors or the Ghost Train, and look around us for the big neon sign flashing ‘EXIT’. Either that, or be trapped forevermore in a state of unbearable yearning for something that never was nor probably ever will be. Did the Sun stand still for one 24-hour long day, in the time of Joshua?